When it comes to getting dressed for real life, you can always rely on Michael Kors to come armed and ready with new styling ideas aplenty. Naomi Watts and Poppy Delevingne watched Kendall Jenner lead the designer’s model pack, dressed in a pretty, but cool and considered SS16 collection. Thou shalt learn to layer, says Michael of the season ahead. Cropped knits with extra-long trousers and soft trenches thrown over the top? This is one we can totally start practicing now. Michael Kors is two things – a) a global-thinking mega-designer and b) realistic. He knows full well that summer seasons don’t always mean fair weather for everyone (sobs) and has reacted accordingly with a whole host of gorgeous trans-seasonal coat options for us to try. See the full collection in the gallery above. The spliced skirt is also having a moment and as a midi-length that’s slashed-to-ribbons, it’s one we’ll be able to team with boots and sandals alike. In soft colours and lustrous silks, Michael’s incarnations are top of our wish list. When it’s summer time and the weather is fine, however, we can only hope to be picnicking in one of his poppy-smattered cotton dresses. Want more good news? Relaxed sliders are still on-trend, meaning we can buy a shiny new pair or just stuff our current ones at the back of our wardrobes and bring them out again next year. Now a Kors summer signature, the poplin shirt and full skirt combo is a winning formula. Why, you ask? Because everyone’s got a white shirt in their wardrobe and working it up with a hyper-pretty embellished skirt is the street style set’s favourite trick. The low-slung hip grazer is back, and looking a lot chicer than when we last saw it (remember those gladiator disc incarnations that everyone had?). Want to make small and subtle moves toward the next season? Start by slinging one of these on over your jumper dress. 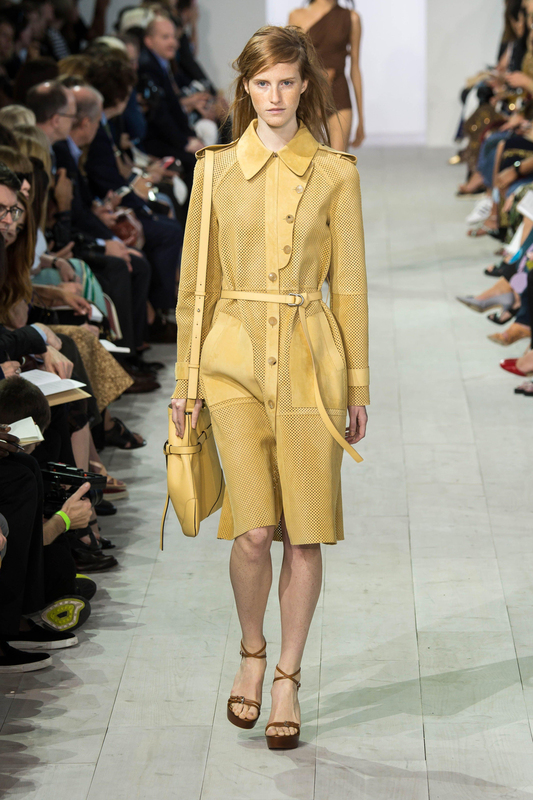 See the full Michael Kors SS16 collection in the gallery above.